Over the years since that beginning, our parish has supported and developed a ministry of hospitality. This is not the only quality that makes a parish successful, but it is desperately needed. A woman who later told me that she had wanted to sneak into church, pray and then sneak out, was met at the door by several friendly people. As she sat down, someone nearby smiled and said hello. The liturgy itself was inviting and authentically warm. Her grandson discovered there were cookies after Mass, which led her to stay a bit longer. By the second week, she knew she belonged there. Many parishes have greeters at the doors. We do, too, but I have found that they function better when they have a deliberate task. So they give out bulletins as people come in. This flies in the face of the receive-a-bulletin-as-you-depart tradition, but people know they are being treated as adults. Hospitality goes way beyond the greeters. We remind people that everyone has to welcome and make room for others. It starts in the parking lot, where people warmly greet each other. On rainy mornings, the “umbrella brigade” is in action as people are met with someone handing them an umbrella to use as they walk in. Inside church, people talk to each other as they enter the gathering space. A warm and clean atmosphere is promoted. Basic needs like being able to see and hear have become significant. Accessibility is one of our goals. It means that people with disabilities of all kinds are not only welcomed but joyfully accepted. Children are treated as full-fledged parishioners, as we do what we can to assist their parents. At all Masses there is a children’s Liturgy of the Word. We have a Sunday morning preschool for kids 3 to 5 years old as well as a nursery with qualified child care workers. One more comment about hospitality. A man who had gone through a serious personal struggle commented one day after Mass he finally was feeling whole again, thanking me and the parish. When I asked what we had done, he said, “Father, don’t you understand? Hospitality is healing.” Little did I know how his being accepted by the community had helped him. In addition to hospitality, a parish that wants to be successful has to address two other aspects in the way Mass is celebrated. The first of those is preaching. As a homilist myself, I know this is an ongoing challenge. What all homilists need to know is that people want to hear how the message flowing from the Scriptures intersects with their own experience. I have learned that the best way to help this happen is to employ visual images as part of a homily. Such images as stories, comparisons, analogies and well-thought-out examples can help all listeners regardless of age or educational background. But these images have to be authentic and not simply something found on the internet. To make sure my words help create a bridge from the Scripture to modern-day life, I often try out parts of my homily with different groups. Frequently I check with other staff members to evaluate what I am preparing. Just as the homilist prepares for Sunday, the people of the parish must do so as well. Our parish has small faith groups that meet regularly and read the Scriptures of the subsequent Sunday. Parents are encouraged to read Sunday readings to their children before coming to church. Through these efforts, as well as insights promoted through our parish website and app, we encourage people to become familiar with the readings before coming to Mass. Homily preparation is work and needs plenty of time. I work on the homily throughout the week, often writing notes and outlines. Only when I feel ready do I actually write the homily, but by that time I truly know it and am at home with it. The final element to help people have a rich Mass experience is the music. This cannot be overstated. Because music is an art form, what appeals to one person may not be the preference of another. What all people like, however, is when music is well-done, inviting and allows participation of the assembly. Our parish is blessed with very good music, much of which is rather contemporary. What is necessary for any church, regardless of music choice, is that it become a high priority and that various resources, including money, be made available to enhance the music program. 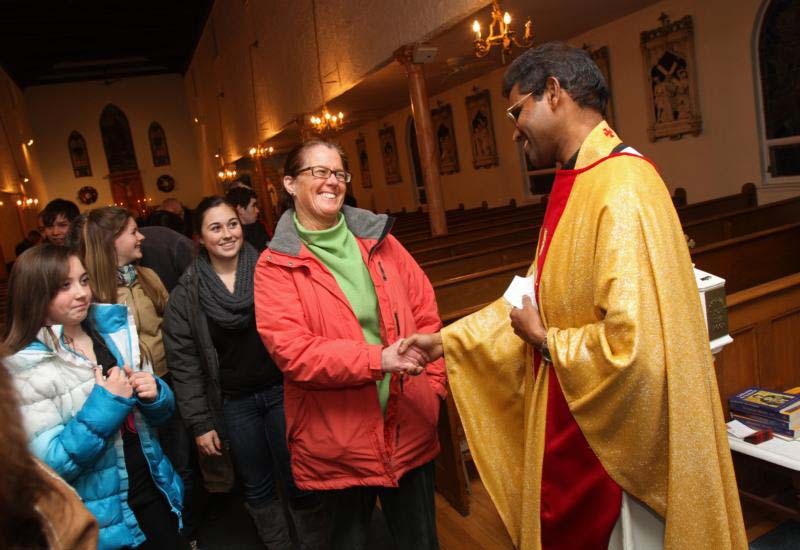 Parish life is more than the Sunday Mass experience, but for many, that is precisely where they get to know a church community. Often that experience is where people find what their faith needs to help them in their discipleship of the Lord.